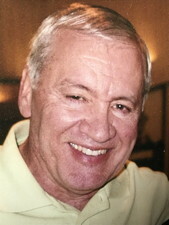 J. Robert (Bob) Ulbrich passed away on Thursday, 8/23/2018 at Evanston Hospital, Evanston, IL. He was born on December 6, 1942 in Bloomington, Illinois, the son of Edward B. and Anne Marie Capodice Ulbrich. He is survived by his wife of over 51 years, Karen (Satterfield) Ulbrich. They are proud parents of their son, Tim (Sarah) of Omaha, NE and their daughter, Sara (Jay) Greenstein of Winnetka, IL. Five grandchildren, Matthew, Isabella, and Makayla Greenstein and Riley and Lauren Ulbrich have filled the last 13 years of Bob’s life with abounding love and joy beyond measure. Family was a cornerstone of Bob’s life and he loved the precious time spent with his family on vacations and holidays. The five “grands” enjoyed a special bonding time with their memaw and pawpaw as they spent their one-grandchild-at-a-time weeklong “summer camp” in Champaign each year. Bob also leaves a brother Ed (Angie) of Normal, a sister Rozanne (Larry) Starkey of Bloomington, and a brother Richard (Stephanie) of The Villages, FL. The Ulbrich clan managed to continue the Ulbrich family tradition of always celebrating holidays together. Bob’s nieces and nephews loved and will miss their “Uncle Bob” and he loved each one of them right back. Bob graduated from Trinity H.S. in Bloomington where he was elected senior class president. Over the years he maintained close friendships with many of his classmates. He graduated from Illinois State University and earned a master’s degree at the University of Illinois. He taught high school in the Chicago suburbs for several years and also served as a school administrator. The bulk of his teaching career (over 33 years) was in the Department of Business and Agri-Industries at Parkland College. He also farmed in the Homer area for many years. Bob was an altar boy as a child and followed in his father’s footsteps when he was ordained as a Permanent Deacon in the Catholic Church in 2007. Since that time he has served at Holy Cross Church in Champaign. Bob provided spiritual care to many parishioners and most of his friends. He was very involved as a Spiritual Director of Cursillo, an adviser to Catholic Daughters of America, a member of the Champaign Rotary Club, and served on the foundation board of OSF. Bob enjoyed fishing, golfing, time spent with friends, and especially those family vacations. He was fun to be around and will be sorely missed, but he gave a great gift to family and friends because they have abundant amusing anecdotes about times they spent with Bob. Being remembered fondly is a sincere tribute to this man who lived his life well. Owens Funeral Home is in charge of the arrangements. Visitation will be from 3-7 p.m. Friday, August 31 at Holy Cross Parish Center, 403 W. Clark St, Champaign with the rosary service beginning at 2:30. The funeral Mass will be at Holy Cross Catholic Church, 405 W. Clark St, Champaign at 10 a.m. Saturday, September 1. Friends and family are invited to attend the funeral luncheon immediately following Mass. All will depart for the burial in Holy Cross Cemetery, Normal at 2pm, for the interment service at 3pm. Memorial donations may be made in Bob’s name to the Professional Development Fund at Holy Cross School, 410 W. White Street, Champaign IL 61820 or The Parkland Foundation, 2400 W. Bradley Ave., Champaign, IL 61821.